Small Cabins – Transportable Pod Homes, Small Cabins, Tiny Houses, Simple Living, Money Matters, DIY and Green Living. So this story begins and Mudjima, Queensland. Julian’s a regular at the “Christian Surfers” and we are at “The Island”, drinking coffee and chatting after a spell on the beach. Jules has been doing his best to stay out of the ocean because of an ear infection and I’m encouraging him by saying that he’s learning as much or perhaps much more about watching by watching the surf and the surfers from the beach, (sometimes it’s just good to sit and study the waves and watch the world go by, but not easy when you are young because when you are young you’re doing your best to ensure that the world does not go by without you). 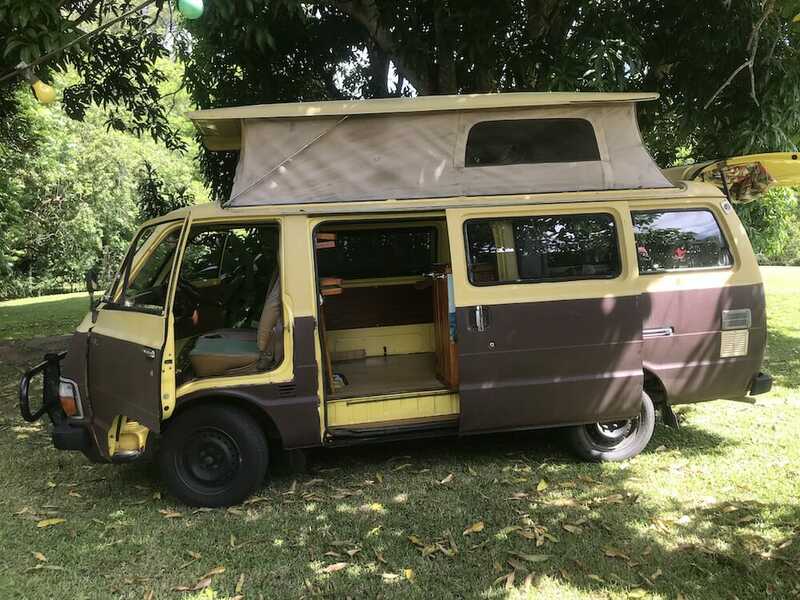 Anyway were at the Island and I need to go to the loo, which is just across the way, but I’m barefoot and my thongs, (slops) are in my van, so I walk down the footpath and see a couple locking up their beautiful classic campervan, and they are about to walk away from it, I say “I love your van, folled by “that’s my van across the way”, they’re friendly and let me know that they have just arrived back from 1770, further north on the Queensland coast, the van played up as they were leaving is stuck and third and fourth gear and won’t go into first and second gear. Their intention they tell me now to sell the van it as scrap and get someone to collect it. Being who I am, an opportunistic cheapskate, I can’t go past the “How much are you expecting to get for it?” question, $500 he says, and I follow with the “Would you consider sell it to me”, Jules and Travis walk by, they’ve packed up and are ready to leave, and we all eyeball the car together and I let Julian know that we can have this thing for $500. Michael the owner wants $1000 with the 6 months of rego he has only just renewed, which seem fair and he gives me his phone number with the reassurance that he is not in a hurry and we can take our time thinking about it, but when he gets back from overseas he’s selling it. 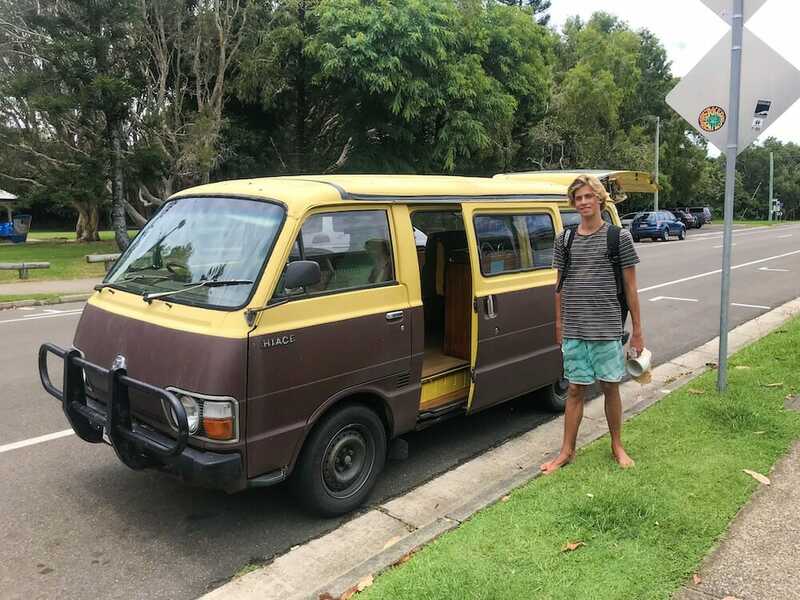 Jules and I are in the “Whoo hoo Beach Wagon camp” so we text the owner and let him know it’s going to be Julian’s first car, and we offer him $800, Michael the owner says he’ll meet us at $900, but he’ll need to keep the registration plates till we get the safety certificate. Michael kindly offers to drive the car up to our place, which he kindly did on Wednesday evening. , “It can be tricky driving a car with only 3rd and 4th gears working”. 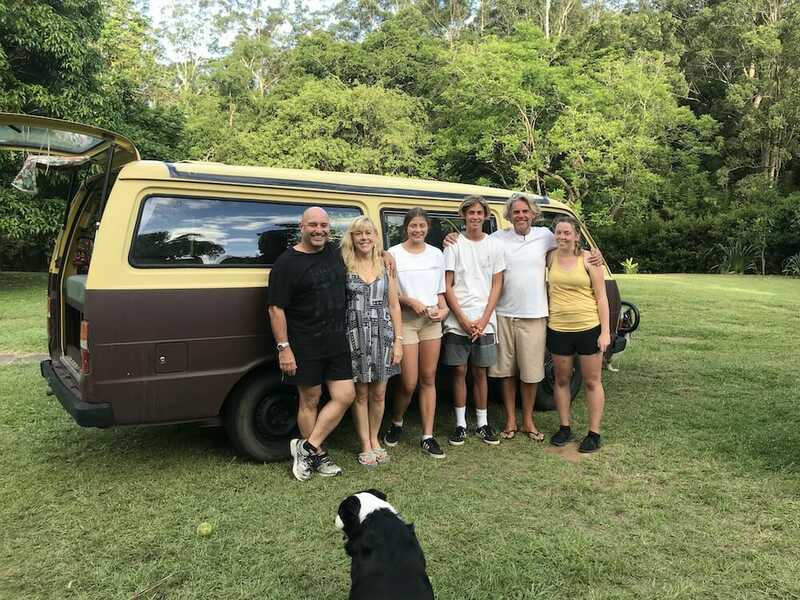 Eyeballing the van at Mudjimba, – it lived opposite the ocean for 7 or 8 months, and as best we can tell it comes from further inland so hopefully, it has not seen too much of the ocean, it has surprising little rust on the wagon. The “popup” is taped up with gorrilla because the van sits out in the open for long spells. This is a lovely view of the broadside of the van, it’s a LWB, about 6 paces long. The following day, we have all the gears working again which was thankful, a very easy fix. Looking back we took something of a risk buying this lovely wagon. It was a relief to know we were purchasing from delightfully sincere people. I figured that if it had been major gearbox issue we could have a) got the gearbox fixed or repaired relatively cheaply, after a bit of effort. 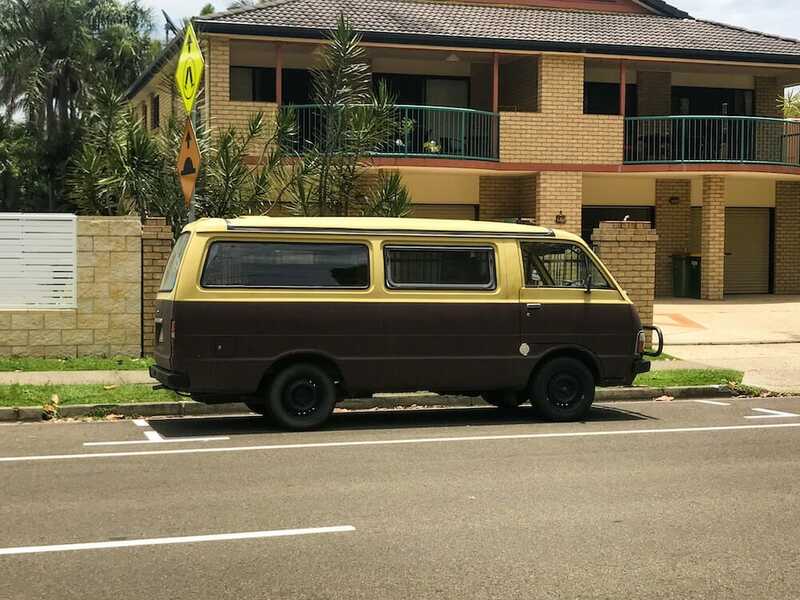 b) re-sold the van and probably come out even, c) learned a $900 lesson about buying cars, shrugging our shoulders as we walked away saying “well that didnt work out so well for us”. Condition: It’s in excellent and you can see it has been well cared for, we have all the papers and receipts showing the work and expenses over the past 2 years or so. Would you like to know what was wrong with the van? The following day when it was light and Julian and had gawked at the wagon, opening and closing everything, were very pleased with ourselves and quietly hoping that it was an easy fix, I opened the engine compartment door, located under the front middle seat, (there are 3 seats in this van). Julian wiggled the gear stick as I looked under the van examining the gear linkage/mechanism and discovered that the gear linkage leaver had come underdone and had a bolt missing. 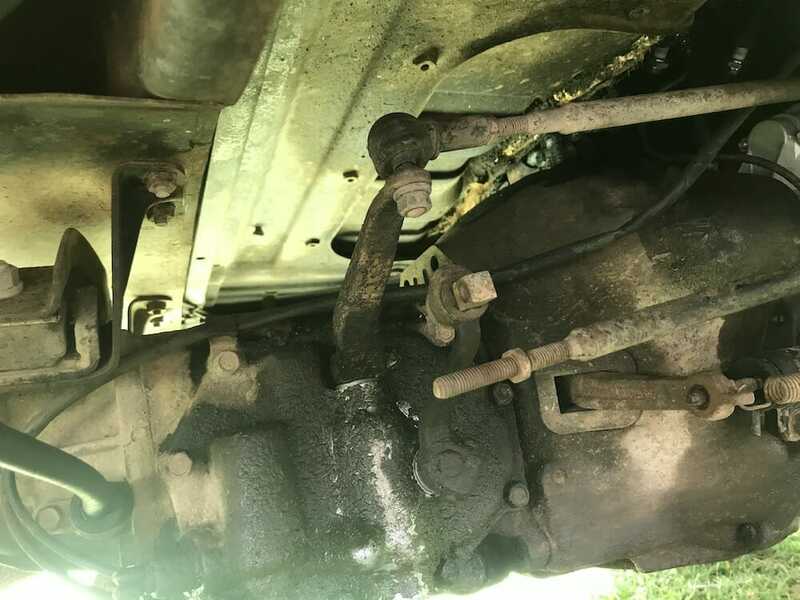 We looked under the car and discovered that the nut has come gear shift linkage bar, where it joins the gearbox, it looks like there are two tie rods, one for 1st and 2nd gear the other rod for 3rd and 4th gears. We found a bolt which fitted the rod, and it all worked fine once we had the rod reconnected to the leaver. I suspect this is the original engine and gearbox and we are considering rebuilding this engine it to keep the van in original condition or perhaps replacing it with Toyota 22R engine from a Hilux which I understand is a more modern engine with fuel injection, will have more power and better economy. From what I’ve read on the internet, the 22R engine can fit onto the bell housing of the original gearbox with very little modification, two small guide holes are what is needed. 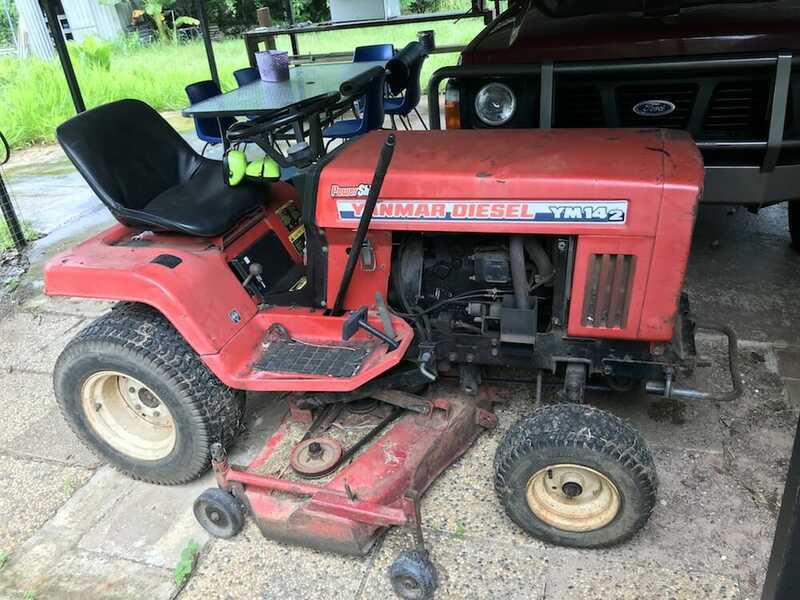 The Yanmar YM14 2 is a versatile a two cylinder diesel tractor lawnmower, which was manufactured in 1983. My YM14 is the probably the most reliable ride on lawmaker I have ever owned although, sticky speaking the YM14 is a tractor not a lawnmower. The deck had been designed to be easily removed and reattached with just a few quick release clips and a bit of fiddling with the drive belt. Unfortunately spare parts and replacements appear to present something of a problem to owners people living in Australia, (as I do), and I have been unable to find suitable suitable blades. Acquiring lawnmower blades to presents something of problem to me and (probably for most Yanmar YM14 owners), because you can’t simply retrofit fit similar brand, because if you did the cut grass cuttings would be pushed downwards and not up and outwards. Plain simple flat mower blades works reasonably well, but certainly not as well as the original equipment would, i.ed using blades designed for the Yanmar PowerShift, the problem most Yanmar owners face is where on earth do you find and purchase new the cutting blades? ( if you know please tell me). There concept this is quite similar to what I imagine an Elastic Home to be like, (except that the modular elastic homes I’ve been thinking about are somewhat larger than Tiny Home, however the principles are much the same. This is great example of an MVP – Minimum Viable Product, and its certainly a lot easier to relocate that the modular homes I’ve been imagining. I have always imagined my family, children and parents living on the same property, this video help me imagine and visualise what I’ve been trying to put together regarding Homes which grow with you. Have a look at my ideas in Elastic Homes and Living. It was supremely boring, and tedious, to say the least. The walls and ceiling are all textured, so it makes it extremely difficult to get a straight line between anything. Its not to everyones liking, happily , Marge likes the result. I like it too … but it is way darker than we both thought it would be, and it gets more grey to it as night time approaches. 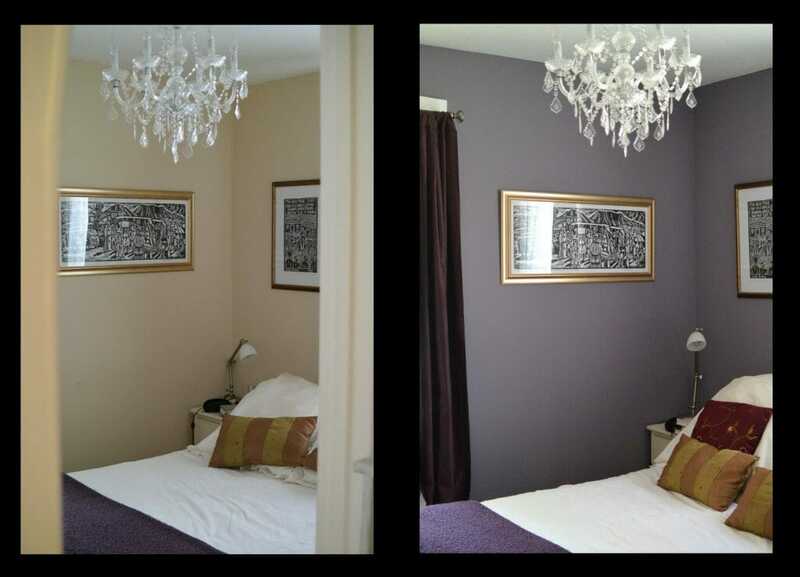 it makes little or no difference … or … one can spend a few days, and a single can of paint … and it makes a big difference to the way a room feels. I should have painted it sooner … but oh well … It is what it is. I’m quite fortunate to live on 2 acres, this home has so much potential, I am pleased the I cleared out much of the garden and made it easier to manage however I do regret cutting and clearing some of the trees and shrubs, most notable the frangipani tree. and the agapanthus, the tree ferns which unfortunately died of their own accord, possibly due to old age or because they were exposed. The nicest part of the land is the flat patch directly in front of where I am standing to take this photograph, although the land extends down to right, past the trees and to Coochin Creek, which would have been a very peaceful relaxing area until the traffic increased on Peachester Road on the other side of the creek. So if I have an aspiration for 2017 it’s to plant Avocado, Bannana, Blue Berries, Lime, Passion Fruit and Paw Paw, at Havilah House. There is a particular variety of lime that Steve Childs told me about which I would like to get. Blue Berries I had when we moved into the propertiy but due to stupidity and putting ash from the combustion stove on the blueberry shrub and caused it to die. – It bring to mind mind a comment “What a fool you are”.